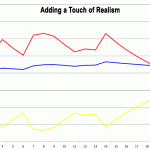 Establishing benchmarks as outlined in part one is the best way to measure changes in fitness. 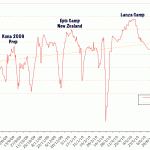 We all want reassurances that training is working so testing roughly every two months lets us keep track. If we’re not improving then we have to consider our program and perhaps make changes. Benchmarking is more than just testing performance in a controlled environment. Once you’ve results they’re a tool for planning and monitoring daily sessions. Knowing threshold heart rate, pace, power or critical swim speed allows you to be focussed during a workout. This is of particular benefit when planning intensity based sessions such as threshold bike work. Our training stresses the body, damages muscle fibres and fatigues us. During recovery the body responds by rebuilding itself to be better able to cope with the strain. Repeated stress at the edge of your physical abilities means repeated repairs that make you a little bit fitter. A massive simplification of a process involving an array of hormonal and chemical processes. The body is in a constant state of breakdown and repair with the balance between the two varying. Push your training and the balance will side with breakdown, take a day off and repair will be dominant. You can have too much of a good thing in either direction. Repeated days of hard training will lead to increasing breakdown and diminishing fitness returns. Dig yourself a deep enough hole and it can take a long time to climb back out. Long periods of rest can be essential to recovery, but fitness will be lost. The body may rebuild itself more strongly when subjected to a stress, but remove the stresses and it reverts to lower fitness levels. All training will provide stimulus for adaptation and fitness gains. There’s an excellent table produced by Andrew Coggan highlighting how different levels of intensity produce differing physiological changes. Have a look at table 2 and see how the zones he defines as endurance through to VO2max produce similar changes. The intensity levels differ in the amount of change they stimulate. 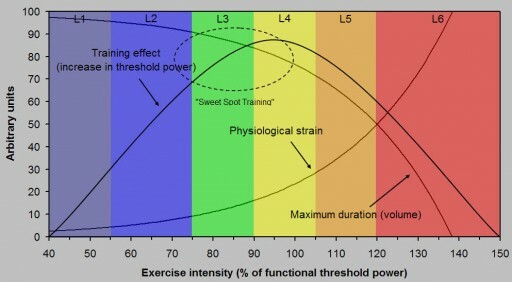 Endurance training provides a low level of stimulation across the board, but threshold (level 4) hits everything well. When you know your thresholds you also know the point that gives the strongest, most balanced stimulation for adaptation. In terms of bang for the buck threshold is at the top. Going out on a long ride in our endurance zone, somewhere under 75% of threshold effort will encourage adaptation. We’re going to have to do a lot more of that kind of riding to get the same results as a session done at 100% of threshold though. So why not train at threshold all the time? By definition threshold is a maximal hour’s effort. If you just train at threshold you’re be limited to an hour each time. Fine in that you could rack up seven hours on the bike a week, but the difficulty is recovery. Threshold sessions aren’t easy and take time to recover from. Done right chances are you won’t be able to string seven together in a row. As the intensity rises so does fatigue and recovery time. We need to balance training sessions across different intensities in order to allow the body recovery. After a threshold session one day we might have a lower intensity endurance session. This way we stimulate further adaptation, but with less breakdown and more chance to rebuild. Repeated threshold workouts are tough and there are limits to how much can be done. There’s an area just below this which has most of the benefits and less of the fatigue. It’s been coined the sweet spot and is a very useful area to train particularly for Ironman triathletes. With less recovery required and most of the positive benefits of threshold sweet spot training fits well into a triathletes schedule. This sort of intensity can be performed more frequently and as the season progresses incorporated into more workouts if desired. I don’t rule out well scheduled threshold sessions they have a place too. Equally whilst looking purely at physiology suggests that a combination of intensity levels gives all the fitness adaptations needed Ironman athletes still need to train long. The tables don’t consider the psychological aspects for a start. Knowing you can ride for six hours is a big step towards racing that long. Similarly you learn a lot about pacing and the intensity you can hold over long distances. I’ve trained with less experienced athletes who spend the first few hours making me suffer before suddenly going backwards. Typically they’re working too hard for the duration or insufficiently eating during the ride. Whilst differing intensity levels cause differing amounts of adaptation the overall stimulation is from volume and intensity. Athletes need to incorporate aspects of both into their overall plan particularly if their goals are long distance event. A way to track sessions accounting for intensity and duration is needed. This is where the concept of training stress and Training Stress Scores (TSS) comes in. There are a number of ways this can be implemented, I use WKO+ so follow its approach to TSS. With a powermeter and run pace this is automatically calculated for me. There are other applications available that can do a similar job. For those without these tools it’s possible to estimate TSS values for each workout as Joe Friel’s article outlines. You determine an RPE for the session or look at average heart rate to determine intensity then take an approximate TSS per hour for this and multiply by time. Not precise, but at the least a rough guide. Factoring intensity and duration into a TSS provides a means to assess and compare workouts in terms of their impact on fitness. Simplistically a higher TSS is a stronger stimulus. 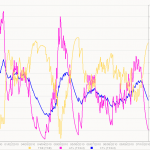 The nature of the training is relevant as you could score a high TSS from long, easy cycling or shorter, hard riding. Racking up TSS through training will improve fitness and lead to the adaptations given in that table. It’s important to balance sessions around differing intensity levels to give a mixed focus. Lots of endurance efforts will slowly improve threshold, but directly training at that level has a bigger impact. Both are needed for the Ironman athlete to really prepare the body for racing. The benefits of consistent training come in the cumulative effect on fitness. Structured sessions at intensities based on your threshold benchmarks are focussed on performance improvements. On its own intensity limits the amount of training that can be done. Combining with lower intensity sessions enables more TSS to be scored over time and fitness to progress. There’s room for a lot more detail on this topic and in the next part I’ll look at the bike sessions from the last week of training. It’ll give examples of how the different sessions try to target different intensities and how that results in differing TSS. It’ll also show mistakes that you can make and hopefully motivate me in the final bike session of the week!